Flu deaths surpassed the epidemic threshold at the end of December, with pediatric flu-related deaths also up, according to data from the CDC. The CDC's weekly FluView surveillance report found that pneumonia- and influenza-related mortality comprised 8.2% of all deaths in the last week of December. This was above the epidemic threshold of 7.1%. Pediatric influenza-associated deaths were also up, from seven a week ago to 10 reported in this week’s data. Cumulative pneumonia and influenza-related hospitalizations continued to climb. The CDC reported 31.5 per 100,000 hospitalizations from Oct. 1, 2017, to Jan. 13, 2018 -- up from 22.7 per 100,000 in the CDC's previous report. Because this is a cumulative rate, the number is expected to increase as the flu season progressed, CDC researchers said two weeks ago. Not surprisingly, older adults over age 65 comprised the greatest portion of influenza-related hospitalizations, which rose sharply from previous-week estimates (136.5 versus 98.0 per 100,000, respectively). This was followed by adults ages 50-64, who also experienced increases from the week-ago report (33.2 versus 24.0 per 100,000, respectively). Outpatient influenza-like illnesses were up, and continued to spread across the country. Data from this week indicates that 6.3% of reported patient visits were due to influenza-like illness (up from 5.8% a week ago). 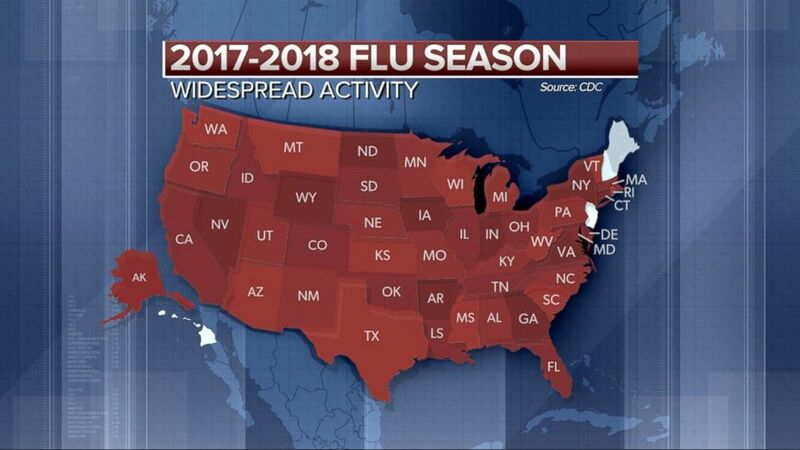 Thirty-two states now reported experiencing high influenza-like illness activity versus 26 states a week prior, and influenza remains widespread in 49 states -- Hawaii being the lone exception.